Sarah Barns is a Research Fellow based at the Institute for Culture and Society. In August 2013 Sarah was awarded a three-year Urban Studies Postdoctoral Research Fellowship by the Urban Studies Foundation (opens in a new window)for a project titled 'Platform urbanism: the role of city labs, data infomediaries and open government experiments in urban governance'. The project examines how urban knowledge is being shaped through smart technologies and pervasive data, and will address new institutional alignments and governance arrangements emerging in key digital cities (New York, Shanghai, Christchurch), including open government partnerships, urban innovation laboratories, and new digital specialist jobs. Sarah's current research builds on her doctoral thesis The death & life of the real-time city: re-imagining the city of digital urbanism, which incorporated ideas from cultural geography, urban studies, sound history, utopian studies, and social and cultural theory, to locate and critique the geographical imaginations of contemporary digital urbanism and situated a creative sound-led response in the city of Sydney. Sarah brings extensive industry and practice based approaches to her work on digital cities. 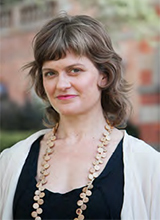 She previously worked as a digital producer and strategist for organisations including the Australian Broadcasting Corporation (ABC) where she pioneered use of location-based mapping technologies for use in emergencies and hyper-local storytelling, and global engineering firm Arup, where she has worked as a Senior Consultant in the Urban Informatics team. As well as digital cities research & practice, Sarah has played a key role in the design and development of national creative industries strategy, funding programs and policy for organisations such as the Creative Industries Innovation Centre (CIIC) and the Australia Council for the Arts. More recently she has led the delivery of innovative public art and heritage interpretation projects through Esem Projects, drawing from her practice-based doctoral research into the use of audio-visual archives for urban place-making and community engagement. PhD, 2011. University of Technology, Sydney, NSW. BA (Hons) Politics. Murdoch University, Perth, WA. 2013: Urban Studies Postdoctoral Research Fellowship. Urban Studies Foundation, 2013-2016. 2007: Centre for Scholarly and Archival Research Award for 'Jaywalking Sydney', National Film and Sound Archive, Canberra, Feb – April 2007. 2008 ABC Digital Media Award for Best Cross-Platform Project: Sydney Sidetracks: Locating History Where it Happened. 2013-6: Urban Studies Research Fellowship for 'Platform urbanism: the role of city labs, data infomediaries and open government experiments in urban governance'. 2013: Senior Consultant commissioned to project manage an integrated online and mobile strategy for the ABC across news, radio, international, commercial and innovation divisions. 2013: Lead Producer & Artist for City Evolutions in partnership with Michael Killalea, Esem Projects. Funded by the Department of Resources, Energy and Tourism (TQUAL), the NSW Heritage Council, The City of Newcastle and Newcastle NOW. 2013: Lead Producer & Artist for ANU Thinking Spaces in partnership with Michael Killalea, Esem Projects (opens in a new window) Installation Project, Jan - March 2013. 2012: City of Sydney Art & About Festival Major Commission for 'Last drinks: one more round at the Hotel Australia (1891 - 1971)'. Produced major public art installation for the Art & About Festival in partnership with Michael Killalea. Esem Projects. August - October 2012. 2011: Kiama Library/Powerhouse Museum NSW Broadband Trial pilot project: 'My place: mobile digital tour', for Kiama Library & Community and NSW Suburb Labs. 2011: City of Sydney Art & About Festival Award for Unguarded Moments, multi-site installation at Millers Point, Sydney. September - October 2011. Barns, S 2019, 'Arrivals and departures: navigating an emotional landscape of belonging and displacement at Barangaroo in Sydney, Australia' in C Courage & A McKeown (eds), Creative placemaking: research, theory and practice (opens in a new window), Routledge, Abingdon & New York, pp. 56-68. Barns, S & Pollio, A 2019, 'Parramatta Smart City and the quest to build Australia’s next great city', in A Karvonen, F Cugurullo & F Caprotti (eds), Inside smart cities: place, politics and urban innovation (opens in a new window), Routledge, London, pp. 197-210. Barns, S & Mar, P 2018, ‘Re-imagining Parramatta: negotiating the arrival of Australia's next great city’ (opens in a new window), Griffith Review, no.61, Griffith University, Gold Coast. Barns S, 2018, 'Smart cities and urban data platforms: designing interfaces for smart governance', City, Culture and Society, vol. 12, pp. 5-12. Barns, S & Mar, P 2018, Waves of people: exploring the movements and patterns of migration that have shaped Parramatta through time (opens in a new window)(PDF, 8MB), City of Parramatta, ISBN: 978-1-876361-04-4. Barns, S 2017, ‘Visions of urban informatics: from proximate futures to data-driven urbanism’, Fibreculture Journal, vol. 29, pp. 1–20. Barns, S 2017, 'Smart cities and urban data platforms: designing interfaces for smart governance' (opens in a new window), City, Culture and Society, DOI: 10.1016/j.ccs.2017.09.006. Barns, S, Cosgrave, E, Acuto, M & McNeill, D 2017, 'Digital infrastructures and urban governance', (opens in a new window), Urban Policy and Research, Special issue on critical infrastructure, vol. 35, no. 1, pp. 20-31. Barns, S 2016, 'Mine your data: open data, digital strategies and entrepreneurial governance by code' (opens in a new window), Urban Geography, vol. 37, no. 4, pp. 554-571. Barns, S & Sumartojo, S 2015, 'When one idea led to another: re-inscribing and recombining thinking spaces using night-time projections at the Australian National University', The Senses and Society, vol. 10, no. 2, pp. 179-199. Barns, S 2014, 'Plus ça change? Remaking the city, 'one site, one app, one click at a time' (opens in a new window), City, vol. 18, no. 2, pp. 226-229. Barns, S 2014, 'Sounds different: listening to the proliferating spaces of technological modernity in the city', Space & Culture, vol. 17, no. 1, pp. 4-15. Barns, S 2013, 'The concrete remains: the art of the modern in downtown Sydney', in P Hamilton & P Ashton (eds), Locating suburbia: memory, place, creativity, UTS Press, Sydney, pp. 188-203. Barns, S 2011, 'Street haunting: sounding the invisible city', M Foth & C Satchell (eds), From Social Butterfly to Engaged Citizen (opens in a new window), MIT Press, Cambridge, pp. 203-17. Barns, S 2012, 'Retrieving the spatial imaginary of real-time cities', Mapping Ecologies of Place, no. 2. Barns, S 2009, 'Sydney sidetracks: listening in to history where it happened using the ABC's audio-visual archives', Australian and New Zealand Communications Association national conference proceedings, Brisbane, pp. 1140-57. 2013: The showpeople's inn. The story of the Beach Hotel, soundscape for City Evolutions, Watt St permanent installation and online. 2013: Thinking spaces: the sounds of the ANU, soundscape for the Thinking Spaces installation featuring ANU 'founding fathers' and contemporary interviews, ANU campus, March 2013 and online. 2012: Last drinks: the sounds of the Australia Hotel, soundscape Produced by S Barns with support from Adam Hulbert for the Last Drinks installation, featured live in Martin Place. September – October 2012 and online. 2012: Rowe St, soundscape produced by S Barns with support from Adam Hulbert for the Last Drinks installation featured live on King St and Rowe Lane, September - October 2012 and online. 2010: Voices, audio platform featuring Open Access recordings of Australian voices drawn from the ABC Archives. 2007: Sounding Sydney, ten 'sound marks' featuring a collection of ambient sound recordings of historical urban spaces within the Sydney CBD, edited with contemporary field recordings, audio CD and downloadable mp3 files. 2011: The pendulum continuum, a site specific video and sound installation at CarriageWorks, featured at Expanded Architecture Festival, October 2011. Co-produced with Michael Killalea and Ian Plowman. 2011: City traces, mobile app and GIS mapping platform launched for Vic State of Design Festival. Developed in partnership with University of Wollongong and the CIIC to promote crowd- sourcing better knowledge of urban environmental transport patterns. 2008: ABC Sydney sidetracks, cross platform storytelling platform featuring audio-visual recordings and soundwalks of Sydney's urban development drawn from the collections of the ABC, the NFSA, the City of Sydney, the NSW State Library, the Museum of Contemporary Art and the Powerhouse Museum. Barns, S 2007, 'Diversions or diversity in a world of limitless connectivity? ', Metro Magazine, no. 152, pp. 90-93. Barns, S 2006, 'Design policy gets down to business', Inside – Australian Design Review. Australia Council (2006) Authored the Australia Council's Creative Innovation Strategy. Australia Council (2005) Authored Response to Prime Minister's Science, Engineering and Innovation Council (PMSEIC) Working Group Inquiry into The Role of Creativity in the Innovation Economy. 2005: Australia Council Working Paper: Trends in Australian cultural participation 1985-2001. 2004 Australia Council Working Paper: Strategic Response to the Changing Economic and Employment Circumstances of Artists. Barns, S 2001, 'Broadband for what? Driving demand', Network Insight Group, RMIT Publishing, Sydney. Barns, S 2001, 'Interactive TV and datacasting: when will it happen? ', Network Insight Group, RMIT Publishing, Sydney. Barns, S 2012, 'Past forward: speculative adventures in the city's archive', invited keynote presentation to the National digital forum, NZ, Te Papa, Wellington. Barns, S 2011, 'Intangible presences: re-locating archives for heritage interpretation using mobile media', invited keynote presentation, Museum and gallery services Queensland state conference, Mackay. Barns, S 2011, 'Dial history: homing in on the street's archive', invited keynote presentation, Sydney Design Week's new ideas design forum, Government House, Sydney. Barns, S 2011, 'In the presence of absence: mapping historical geographies of place', Institute of Australian Geographers conference, 3-6 July 2011, University of Wollongong. Barns, S 2011, 'The unruly city: when tall buildings came to town', refereed conference paper for Remembering the green bans seminar: Institute of Australian Geographers conference, 3-6 July 2011, University of Wollongong. Barns, S 2010, 'Amplifying the city-screen: encounters with contemporary mobile audio practice', UTS conference auricle: sound cultures of the future, Sydney. Barns, S 2009, 'Sydney sidetracks: listening in to history where it happened using the ABC's audio-visual archives', Australian and New Zealand Communications Association national conference, Queensland University of Technology. Barns, S 2009, 'Sydney sidetracks as a location-based service', HCSNet workshop on social and mobile technology to support civic engagement, QUT. Barns, S2009, 'Locating cities of lost sound', British library sound archive conference unlocking audio 2: connecting with listeners, London.